Free trade agreements (FTAs) are arrangement among two or more countries under which they agree to eliminate tariffs and non-tariff (NTB) barriers on trade among themselves (Cooper, 2014). Theoretically, companies shall be interested in increasing imports from FTA regions because of the duty-free treatment (i.e., the trade creation effect). Particularly, not paying import tariff duty can be a great cost advantage for textile and apparel (T&A) companies given the fact that the average US import tariff rate was still as high as 8% for textiles and 11.6% for apparel in 2016 (WTO, 2017). 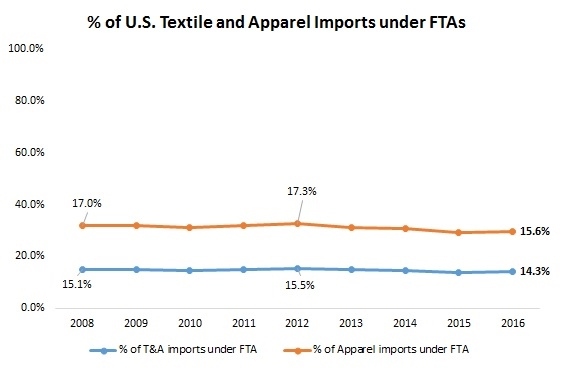 Despite the potential benefit of using FTAs, data from the Office of Textiles and Apparel show that 85.7% of US T&A imports came from non-FTA regions in 2016. Interesting enough, although more FTAs have taken effect in the United States, T&A imported under FTA as a percent of total T&A imports dropped from 15.1% in 2008 to 14.3% in 2016. Among the FTAs in force, the North American Free Trade Agreement (NAFTA) and the Dominican-Republic-Central America Free Trade Agreement (CAFTA-DR) altogether accounted for 75.9% of the value of total U.S. T&A imports under FTAs in 2016. Statistics further reveal that sometimes companies did not claim duty free benefits of FTAs even though they imported T&A from the FTA region. For example, in 2016 about 29.9% of U.S. T&A imports from South Korea, 24.3% from CAFTA-DR and 16.3% from NAFTA and 12.9% from Columbia did not enjoy the duty free treatment granted by the respective FTAs. Some industry experts say the complex T&A rules of origin is a major factor why US T&A companies are not using FTAs enough. 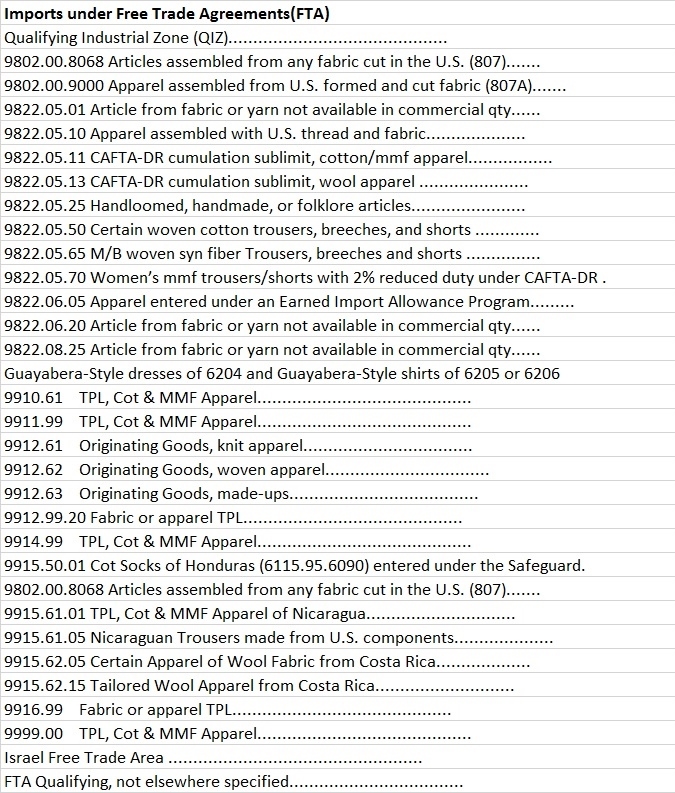 According to the Office of Textiles and Apparel (OTEXA), there are more than 20 different tariff lines dealing with various T&A rule of origin situations under respective FTAs. Additionally, U.S. T&A importers seem to use the “short supply list” mechanism–an exception to the yarn forward rules of origin under FTAs, more actively. 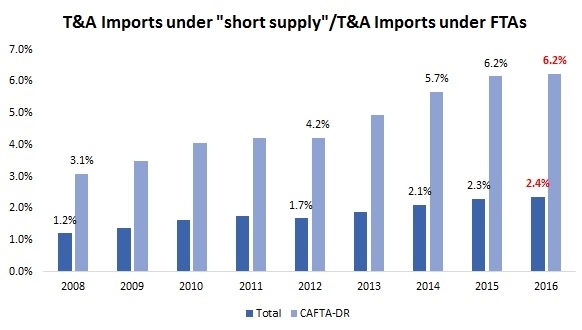 For example, in 2016 around 2.4% of US T&A imports under FTAs took advantage of the “short supply list” mechanism, increased from only 1.2% in 2008. Similarly, a record high of 6.2% of U.S. T&A imports under the CAFTA-DR used the short supply list in 2016. FTAs should be more commonly used because of their duty free treatment, although most companies do not claim the duty free benefits that come along with FTAs. NAFTA and CAFT are the most known FTAs and together” account for 75.9% of the value of total U.S. textile and apparel imports under FTAs in 2016”. President Trump wants to renegotiate the NAFTA agreement which will negatively affect producers, consumers, and exporters because prices and costs will be inflated. Trump believes remaking NAFTA will benefit the U.S. because it will bring manufacturing back to the U.S. increasing jobs. The TPP is another FTA in which Trump has intentions to withdraw from. I believe US Textile and Apparel Imports are using FTA’s but they may be a thing of the past considering President Trumps future plans for the country. I think the rules and short supply lists for Free Trade Agreements should be revised. FTA’s obviously prove to be very beneficial but companies are forced to jump through hoops to even reap the benefits. Companies and suppliers are becoming less interested in actually utilizing FTA’s because of all the back doors and short cuts some use in order to make more money. The Trump Administration really opposes FTA’s and wants to eliminate them in order to create more jobs in the United States. However, I think a happy medium can be met. They need to meet in the middle. The FTA’s such as the NAFTA and CAFTA need to be revised. There are too many loopholes and too much confusion. Updating these agreements could significantly enhance their success and image. I found this article interesting in regards to what we’ve learned in class about FTA’s. I am surprised that only 14.3 percent of U.S. imports came from FTA regions in 2016. I believe that it would be beneficial if the U.S. entered more FTA’s with different countries, especially since we’ve seen the T&A industry has been shifting to new countries in Asia, South America, and Africa. However, although this would be beneficial for both U.S. apparel companies and consumers to achieve lower priced goods, with the new administration in the U.S. it looks like the use of FTA’s will actually decrease. This is unfortunate, especially for myself because I plan on working in the fashion industry within the next year. Similar to what we’ve talked about in class I believe if the rules of FTA’s were easier to understand and has less nitpicky rules, more companies and countries would enjoy the benefits of FTA’s. We’ve noticed this issue since the first USFIA benchmarking study back in 2014. Unfortunately the situation hasn’t been improving. Many respondents say the duty savings are not worth the time and resources required to comply with programs and obtain the required documents from the suppliers. On the other hand, while majority of apparel come from Asia, US has few FTAs with Asian countries. I found this article very surprising because in class and politics we always hear about the benefits of trade and FTA’s and how they benefit the countries involved, but we hear very little of the downsides. Some industry experts say the particular T&A rules of origin is a major factor why US T&A companies are not using FTAs enough. I find it very interesting how there are more than 20 different tariff lines dealing with various T&A rule of origin situations under the same FTA’s. One of the purpose of trade agreements is to be able to trade freely without tax, or for a cheaper price. This is supposed to benefit countries who are trading goods with one another, that the other countries need. The fact that there are so many discrepancies with FTA’s that we barely hear about it definitely a good topic for discussion. I always thought FTAs were beneficial to companies and that they were widely used. But despite the potential benefit of using FTAs, data from the Office of Textiles and Apparel show that 85.7% of US T&A imports came from non-FTA regions in 2016. I think the FTA along with NAFTA need to be revised and updated to be proven useful once again. Trump believes improving NAFTA will increase manufacturing in the U.S. But skeptics like Julia Houghs believe that would be detrimental, causing less higher level jobs to be created. Next Next post: Is the US Trade Deficit a Problem?